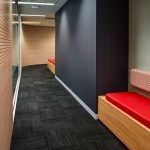 As part of the Australian Electoral Commission’s portfolio, IA Design have been engaged to design and deliver their Heatherton office fitout. Following a national guideline that was developed by IA Design, Heatherton has been designed to fall in-line with other newly completed offices, also taking into consideration additional requirements due to site constraints as well as the needs of the operating staff. As part of AEC Heatherton’s requirements, the office is to include a public reception area, 2 meeting rooms, secure store, utilities, breakout kitchen area and open workspace.